Some times things cost more for a reason. We all grew up hearing conflicting stories about the difference between luxury and off-brand items. Anecdotes like the idea that all potato chips are made in the same factory and the only difference between Frito and Kroger is the packaging they come in. Or other stories that off-brand meats are mixed with scraps of leather and only buying name-brand quality can ensure a man gets what he wants from a product. There’s no definitive line that can be drawn saying that all luxury is the same product with better packaging, or that all generic items are inferior, dangerous products and should be avoided like the plague. Instead, individual men need to adopt a mentality that’s old enough it’s become its own aphorism: Penny wise and dollar smart. It’s easy for most men to see the importance of being penny wise. If I have $100 today and need a new pair of shoes, it’s in my best interest to buy a pair that costs less than $100. I’m not spending more than I have, and am saving my pennies. However, that pair of shoes that cost me less than $100 will most likely only last me for a year or two. After that I’ll have to purchase another pair, and then another after that. 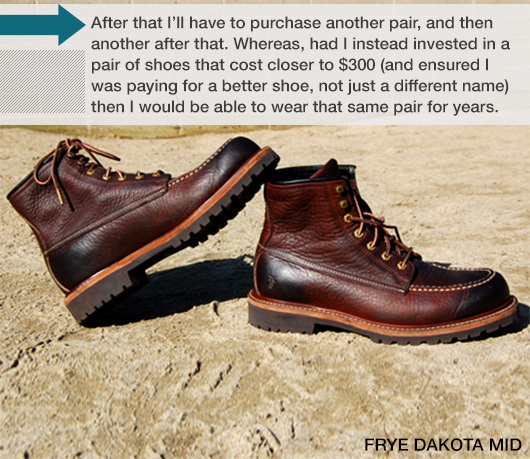 Whereas, had I instead invested in a pair of shoes that cost closer to $300 (and ensured I was paying for a better shoe, not just a different name) then I would be able to wear that same pair for years. So the cheap shoes over ten years end up costing me a total of $500, but the more expensive shoes only cost me $300 over the same period of time. But even with that understanding in the back of his mind, there are a significant number of men who refuse to splurge on any item in their wardrobe or other aspect of their lives. All of these may be valid reasons for avoiding particular purchases at particular times, but it is wise for a man to learn to control these impulses instead of being controlled by them. All of us will have the need for better quality throughout our lives. Once we recognize that and we learn what luxury items will improve our lives, we can start to make wiser purchases. Knowing what a man needs in his life is obviously an individual undertaking and not something that can be summed up for all men on one website. But, what we can do is help illustrate what the major benefits are to investing in a higher-quality purchase. That “wool blend” item that comes from certain retailers when a man buys one suit and gets seven free can be 98% polyester and 2% wool. Technically it is a wool blend, but only technically. What many men fail to realize is that the cloth used in suits across the world varies greatly. That “wool blend” item that comes from certain retailers when a man buys one suit and gets seven free can be 98% polyester and 2% wool. Technically it is a wool blend, but only technically. Polyester may be more durable but it doesn’t breath well, it’s not as comfortable, and it gets a terrible sheen in places that see too much use and abuse. Wool is more expensive to use because it’s more difficult to access. Mills have a limited number of sheep on a limited number of farms. Whereas polyester can be created night and day with fewer limitations. So, it may be cheaper, and the suit may even be more durable (arguably). But it won’t look as good and it won’t wear as comfortably – making it more of a pain to wear than a pleasure. A cloth’s quality isn’t the only factor in its price. Another large aspect is its rarity. The difference between cashmere and wool is a great example. Wool comes from sheep all over the world. There are wools that come from nearly every continent. However, cashmere is the product of a specific breed of goat – the cashmere goat. On top of that, cashmere is not a wool, it’s a hair. The amount of usable hair per goat is smaller, the amount of overall goats is smaller, and this is what makes cashmere more expensive. 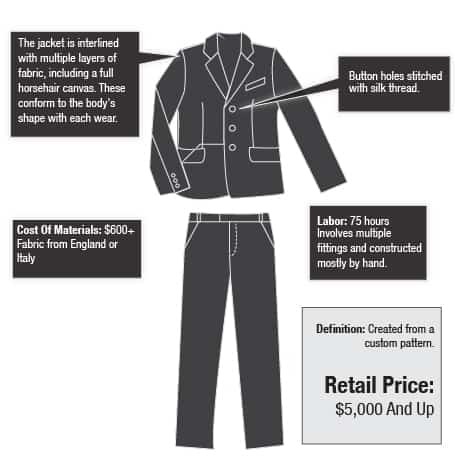 There is more time and effort required to obtain enough material to make a suit. 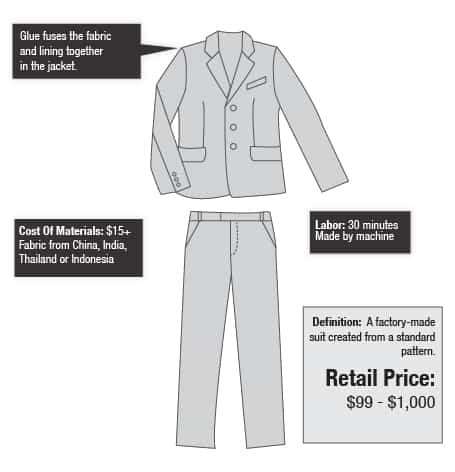 It costs the farmers more, it costs the mills more, it costs the suit maker more, and it costs the consumer more. Some men value rarity for rarity’s sake. It’s what makes gold valuable. Others value an item despite its rarity and are willing to pay more for the benefits regardless. 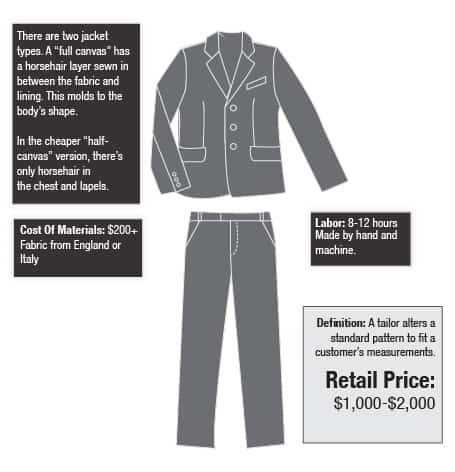 Continuing with our suit comparison, it’s not just the cloth that determines the cost of a suit, but the way in which a suit is made. Entire books have been written about all of the different aspects of quality suit construction. Rather than going into overt detail, check out this great summation from NPR. The last reason men are willing to pay more for luxury may be considered shallow or vapid, but it is a valid reason for some – name brand. Our lives are largely driven by our relationships with other people. Family, friends, co-workers, acquaintances, competition, they all impact us. Some men see a name brand as a tool in their tool bag. Customers can be convinced of the quality of a restaurant by the top-shelf drinks they serve. Clients can be convinced of a consultant’s success by the car he drives and the watch he wears. Our brains try to be as efficient as possible. As a result, we often will make shortcut value associations and name brands help us accomplish just that. This is an amoral aspect of our lives and is something that can be used to a man’s advantage if he chooses to do so. While learning where to invest in quality is one aspect of being dollar smart, its counterpart is knowing what purchases are still worth making as cheaply as possible. This especially holds true for a man’s wardrobe as a well-dressed man should have an intentional balance between timeless style and fashion. Trendy or attention-seeking items are better off picked up on the cheap. Stacked bracelets, bright chinos, a loud blazer, and other pieces that fall more towards fashion than style won’t see as much rotation in a man’s closet – making their durability and longevity less important. Trendy or attention-seeking items are better off picked up on the cheap. Stacked bracelets, bright chinos, a loud blazer, and other pieces that fall more towards fashion than style won’t see as much rotation in a man’s closet – making their durability and longevity less important. They also won’t see as permanent of a stay in a man’s wardrobe. I love a good pair of bright blue chinos as much as the next style blogger, but I’m under no delusion that I won’t feel the same way ten years from now. On the other hand, timeless items like well-made dress shoes, suits, sweaters, and coats typically will be more traditional in their styling. These same items can also see much more daily use and abuse – meaning it’s a better financial decision long term to invest in the highest quality a man can in the beginning. Items that take a beating, things like bags, jeans, leather jackets, and others are also going to be worth investing in. In the long run, it’s a much better value proposition to buy an item nice and buy it once, then it is to have to continue to make upgrading purchases. 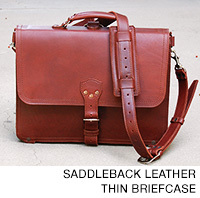 See how Saddleback Leather doesn't cut corners. Daily and simple things that see regular rotation are fine to save on. Underwear, T-shirts, socks, etc. are items that don’t see any major differences in either comfort or quality when the price goes beyond a certain point. A T-shirt from Target will fit just as well, feel just comfortable, and last as long as one from Prada. The final piece to the puzzle of learning to invest in a quality wardrobe is knowing when to make those quality purchases. Just because a man wants to pay for quality items doesn’t mean he wants to pay more than he has to. If a man is dead set on buying new items, his best option is to take advantage of sales. Those may be seasonal, related to holidays, or part of a promotion for a specific store. It doesn’t matter what the sale is, many of the best items still see severe mark-downs. Another way to approach purchasing quality items is to continue the long-term mindset by buying out of season. Most retailers work with limited space and need to clear out items from each season to make room for what’s next. Buying a coat in the summer or swim trunks in the winter is a great way to capitalize on better prices for great items. The only downside to this approach is that many items, such as suits and dress shoes, don’t change as much on a seasonal basis. That pair of of double monks wears just as well in the spring as it does in the fall, so waiting for it to be off season is a fruitless exercise. The other route is to go after used purchases. Because quality items last so long and so well, it’s often easy to find them for very low prices and still in great quality. Options like eBay and thrift stores require a bit more digging, but when a good find is made, the cost per item is typically lower than through any other channel. The key to all of this is for each man to take the time to make thought-out, deliberate decisions about what his best choices for long-term investments and the best ways to make those purchases. Each of us will have different needs, but each of us should buy the absolute best we can afford when the value is worth the price. Tanner Guzy runs a style blog and consulting business called Masculine Style. He believes in a uniquely masculine aesthetic and wants to help men learn to use their clothes to accomplish their goals. He lives in Salt Lake City with his wife and daughter. Enter to Win a Set of Port Products and a Joshu+Vela Dopp Bag from The Motley + a $10 Coupon Code for Everyone! Just remember that good construction does not equal good functionality. I bought a Saddleback wallet about 8 months ago thinking I’d have a wallet for the rest of my life. The build quality and leather are great, but it just isn’t designed very well. The card pockets are shaped strangely, and they crack every single credit card or driver’s license or anything that I put in there. Without fail, if I get a new card it will crack about half an inch from the top (where it pokes out of the pocket) within a month or two. The wallet will no doubt last forever, but I’m on my 3rd replacement driver’s license since I bought it. Thanks for the tip, Eric. I’ll try. I didn’t mean to disparage Saddleback, most of their products are really well-reviewed. I was just illustrating that research is important, especially if you’re buying something expensive to last a long time. A $50 wallet isn’t the end of the world, but if I had purchased one of those great bags they make for a lot more, and it had some fundamental flaw, I would be very upset! This is confirmed, Dave from Saddleback acknowledged the issue and apologizes for anyone who had cards crack. The new design (which I have) avoids the problem. Saddleback is fantastic, they will replace your wallet with the new version. For the shoes at the top, the Strand, is that the Walnut-Calf color? How old are they? Seriously have my eye on them. Yeah, those are the walnut color. Make sure you look into a matching belt too, so you aren’t beltless like me because no belts I already owned matched. The Manistee belt from AE is the belt that matches the Strand. It is pricey though, around $115. Get the shoes shoes and/or belt from seconds. Limited options, but if you don’t mind a minor crease before wearing either, you get what you want and save dough. If you don’t have a matching belt go with suspenders or always go with suspenders as they allow a lot more expression without the need to match. I’ve been purchasing vintage Trafalgar silk tapestry style they are very high quality reparable by the company and best of all, they hold my trousers up. I have both now – suspenders and a walnut belt – but was just hoping to help Eric avoid my mistake the first time I wore my AE walnut shoes. A matching belt is a detail that can be (and was, in my case) overlooked when just a reversible brown/black or one brown and one black belt works 99.9% of the time. Tangent off of my previous post, but I just snagged the Shaker Heights seconds from AE’s shoebank – under $200 for ~$350 boots…yes please. They are the Walnut-calf. I get at least one compliment from people every single time I wear mine. Not only are they the most comfortable pair of shoes I own, they extremely good looking too. You cannot go wrong buying them! I’ve had ’em since 2010. Great article. I am trying this year to buy less and buy better. I’ve been wearing a lot of target, gap, and jc penney (because I used to work there) up until more recently and I have started to switch to better stuff and the difference is very noticeable. I picked up a couple of sweaters from J crew this winter and they fit and feel so much better than the gap ones I have now. I also got a dress shirt from Charles Tyrwhitt and it is my favorite shirt because it just feels so much better than the stuff I was wearing before. Don’t forget that there are different levels of materials too. One hundred percent wool pants or suit from one brand does not equal they same in another. If there is any one piece of clothing that I can say is worth investing in, it is definitely shoes. 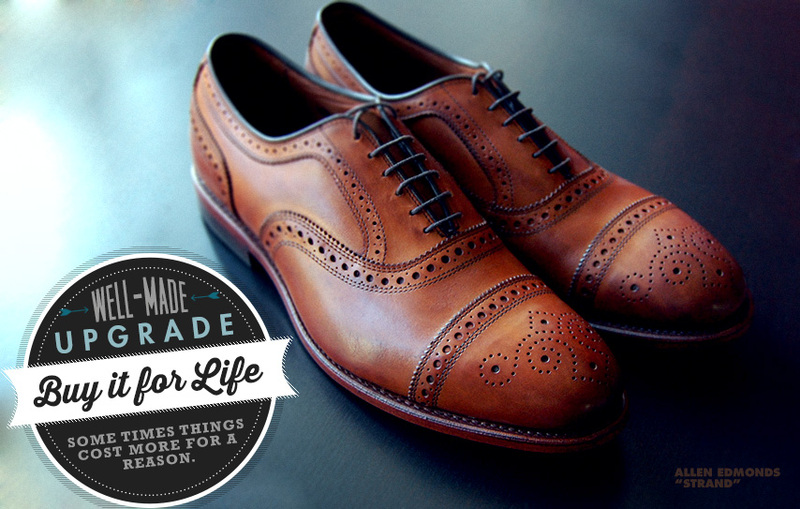 They take such a beating and you have to walk in them all day, why not get more comfortable, longer lasting shoes? I’m with you on Charles Tyrwhitt. My first shirt from them was an education in what quality feels like. Sometimes, going “good department-store” as opposed to “designer/heritage-brand” is actually the most sensible approach for cost against quality. In the UK, Debenhams have long-standing in-house designer brands like Jeff Banks, which I’ve bought smart wedding/interview clothes from in the past. I’ve found the quality and style to be fantastic, costing me much less than a designer equivalent. A Calvin Klein woolen suit will obviously have the edge over a department store purchase, but that “edge” will cost at least 6-times as much. There’s another side to this, though – the robbery or loss factor. Yes, you can be uber-careful with your belongings, but we all make mistakes or are vulnerable to something happening out of our control. If a flood or some other natural disaster wipes you out, it’s easier to stomach replacing a cheaper item versus a expensive one. It may be a psychological factor, but it’s there nonetheless. That’s what insurance is for. More on the robbery and natural disaster side, less on the losing side. A gentleman can never go wrong buying quality. Buy something you want and like, it will last long term, you will use it and be happy with it, and enjoy it. If you cheap out, you will be confronted with that cheapness every time you use it, you won’t be as happy with it, it won’t work as well or last as long, and you will always be thinking “why didn’t I get the other one. Perform your due diligence, learn what’s the good stuff and what’s the cheap crap, Be discerning, be picky, and choose well. Find “mentors and advisers” to learn the ins and outs, whether it be a tailor, a dentist, a car mechanic, or a home builder. Avoid the short term trendy/fad items. Classics are classic for a reason, they never go out of style. That’s where you put your money. You’re right about putting quality first. But classics in fashion do go out of style, albeit for a few years. It took a few years for wayfarers, double-breasted blazers, and brogues to return, after all. This is stll long enough for a clothing investment to seem wasted. Brand-loyalty might be the next best approach. For example, I’ve found Gap jeans to work great on me, and I’ve personally found the quality to be much superior to the Levis and Wranglers I’ve bought in the past. 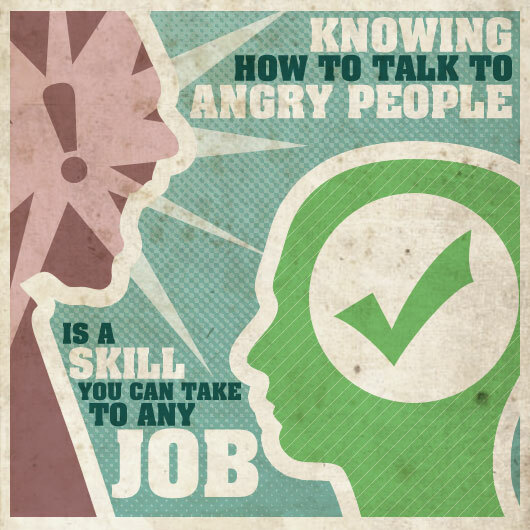 This should be mandatory reading for people out of college. I wish I had this ingrained in me at an earlier age. I’m starting to adopt this approach to buying, although budget is still an issue for me. I tend to look at materials at the moment (eg: jumpers of at least 75% wool as I know these are better for warmth), although I only concentrate on quality over cost when it comes to Outdoor and All-Weather gear. But when it comes to street fashion, the issue is whether these items are going to go out of style in a few years’ time. We talk of perennial “classics” that “never go out of style”, but the reality is that they do “hibernate”, at least for a few years. Then they reappear again, meaning a heavy investment will have a shelf-life (of sorts). Much as I would like a pair of Redwings, I know everyone who bought a pair will be hiding these away in a few years, when the next trend has come along. This is where the high-street (or mall) equivalents come in useful. You get a fashionable equivalent for much less investment. It’s a case of keeping fingers crossed in terms of quality, though. Great article. Spot on for the most part. I am going to have to disagree about the T shirt comment. Yes, after a certain price point the differences are not justifiable. But comparing any old Target T shirt to a higher end one, massive differences in comfort will be very noticeable. Take a Vince t shirt for example. A little pricey for a plain T. But hands down the most comfortable T shirt I have ever worn in my life.